Do you have a fond memory of growing up in Wilmette? A favorite place? Artifacts of times past? Please share them! Complete the form at the bottom of the page (jump to the form) and your story may be considered for posting. Meanwhile, we hope you'll enjoy the following stories submitted by Wilmette residents past and present. I saw the story entered by Alison L. about her grandfather, Dr. Floyd McGrath. My family were patients of Dr. McGrath. I am now 73 and I remember Dr. McGrath well. I remember his overflowing ashtray at his desk, the waiting room, the black VW he made house calls in and the giant black X-ray machine. He treated us kids for it all - birth, chicken pox, measles, scarlet fever, polio. Dr. McGrath brought me into the world at about 11:00PM on June 16, 1944. I lived at 2131 Kenilworth Ave from 1935 until 1955.I attended New Trier High school graduating in 1950. I attended Highcrest elementary school and graduated from Howard elementary in 1946. My grandfather lived in Wilmette and practiced medicine in Wilmette for over 50 years, from the early 1920s to the early 1970s. His name was Dr. Floyd McGrath. His office was over the original Wilmette State Bank and then in the Brown Building. He had evening hours, made house calls, treated patients for free, paid for their medications if they couldn't, traded with patients during the depression. My mother grew up in Wilmette and except for a time living overseas was a Wilmette resident for 56 years when she passed away . She lived in Wilmette from 1926 to 1982. She was a graduate of New Trier. I grew up in Wilmette and graduated from New Trier East. I remember Saturday afternoons at the Wilmette Theatre. Amazing birthday parties there with Ice cream cake from Baskin Robbins. My grandfather passed away when I was 14 and my mother when I was 21 so many of the records and pictures are missing. I have stories from Wilmette residents about how my grandfather impacted their lives and that close knit feeling and warmth of a small town has always stayed with me. Please note: Stories may be edited for length or clarity and will be posted as space permits. Not all stories will be posted. You may also choose to share your story without having it considered for posting. Please provide your full name in case we need to contact you. If your story is published, we will identify you only by first name and last initial unless you request otherwise. I would like my story considered for publication. I want to share my story with the Museum but do not wish to have it published. 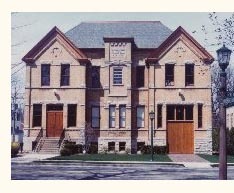 By clicking Submit, you are giving the Wilmette Historical Museum / Wilmette Historical Society permission to use, on their website and/or in printed materials, the information and materials you are submitting. You are further certifying that you are the owner of these materials and have the authority to grant this consent.